We offer artificial turf ideal for short term hire for trade fairs, exhibitions, corporate events, product launches, TV adverts and photo shoots. Artificial turf can be a good alternative to carpet as it is hard wearing and “party proof” – you don’t have to worry about food or drink spills. Our artificial turf’s 25mm pile with multi-colours of greens gives a natural look. Great for a real life grass effect and can be laid on any solid surface. Artificial turf hire can be set and removed in a matter of hours, and is available in NSW and VIC 7 days a week. 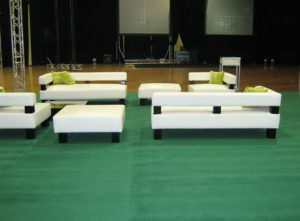 We also provide Media walls along Artificial Turfs to ensure a stand out professional event. If you are planning an event in Sydney or Melbourne, contact us today to discuss your artificial turf requirements.